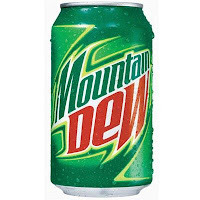 Yesterday afternoon, Grandpère opened a can of Mountain Dew in the back yard, took a swig and put the can down briefly to do a chore. A few minutes later, he took another swig, and a bee flew out of the can, but not before stinging him on the lip. GP seems to have more than his share of odd and freaky accidents, most of them resulting in only minor injuries, thank heavens. He came inside and said, "Guess what happened." I said, "How did you hurt yourself this time?" with the big one in mind, although I could see that he was in one piece and not obviously bleeding. Apparently, the bee was thirsty and was attracted to the soda can by the sweet smell and decided to have a swig, too. "Take a Benadryl," says I. "No, I don't like taking medicine," says he. Before long, GP was back in the house with a bulbous bottom lip. Of course! I gave him a short anatomy lesson, telling him that the lips were not far from the throat (like the knee bone is connected to the thigh bone), and that he would not want his throat swollen so he couldn't breathe, and that I would rather avoid a trip to the ER. He took the Benadryl. About a half hour later, I suggested he take another, which he did. By the evening, the swelling had gone down quite a bit. It's not easy being right all the time when dealing with a stubborn man. Oh dear, you may have to crush the meds and put them in his chow as though for a puppy. I am relieved GP is all right. Paul, I'll remember your suggestion next time...in the food bowl. 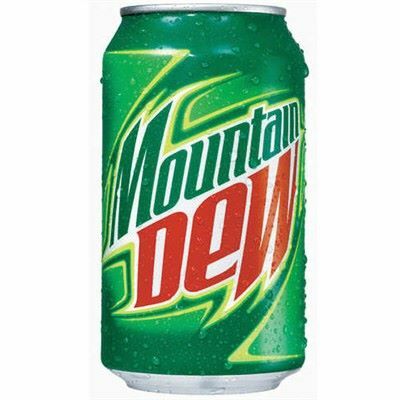 Did you read about the lawsuit against Pepsi (Mountain Dew) wherein a man found the remains of a mouse in his MD can. Pepsi's defense was that there was no way mouse remains would have be detected in a can of MD -- if a mouse had gotten in a can at the bottling company, it would have been well decomposed by the time someone opened it. :-) Seriously. Glad it was only a bee! 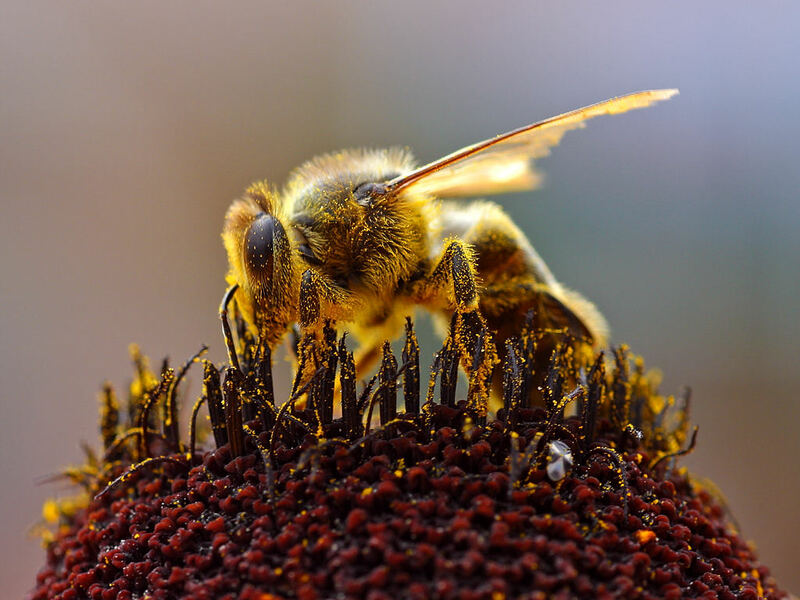 Only a bee can sometimes be deadlier than a mouse, especially if the stingee is allergic. And it's hard to know if an allergy exists because it builds up over the years. As you say, Mimi, the lip is too close to the throat to take a chance. And a sting in soft tissue like a lip can swell up fast! I'm glad that GP took the benedryl. Hardheaded men are hard to live with sometimes! Barbi, according to Snopes, the part of the story that is true is that a man does have a pending suit against PepsiCo and the report of the testimony by a veterinarian that the mouse would have turned to jelly. According to further testimony by the same vet after examining the mouse that the customer submitted, he said that particular mouse could not have been found in the can of Mountain Dew. You are right that the mouse would have decomposed. Eew! I don't drink sodas at all, not because of fear of a mouse in the can, but because they are empty calories or contain artificial sweeteners, which I can't stand. 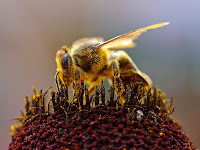 susan s., you are correct, and GP was once a beekeeper and has been stung many times, so he really should be careful. If I ever got stung by a bee, even on my toe, I would take a double-dose of Benadryl right away. I discovered about twenty years ago that I'm allergic to penicillin and sulfur, and it weren't purty. Glad Grandpère finally listened to you! PJ, I'm allergic to sulphur and to Cipro, and neither experience was pretty, and if I get stung, I immediately head for cabinet with the Benadryl. Why my man so stubborn? I AM always right. amyj, they never learn. No wonder! They are all boyfants. What a great neologism! LOL! Not only does Word Verification have intelligence, it has a sense of humor. A bee in January is quite an achievement. Good he didn't swallow it, isn't it? Lapin, Tom admitted that it could have been worse, that had he swallowed the bee, however long the critter survived, he could have been stung in his digestive track. oh my how awful for him - glad you suggested benadryl. A poultice of meat tenderizer is good to take down the swelling -- also ice works. Ann, GP is fine today, back to normal. Glad he is better. It could have been serious. Mimi, I think it must be easy being right all the time, because you are. Amelia, it could have. What's the big deal about popping an antihistamine? JCF, non-insane masculinity is a good way to put it. Just a brief note of male solidarity here for balance, I don't like taking medicine either. I do it, but that doesn't mean I have to like it. theme, you take your medicine. That is the difference. Glad GP is doing okay. He sounds way too much like my husband. Stubborn men are hard to deal with sometimes. Living with someone who is always right can be a burden and could even be offered in a plea of justifiable uxoricide. Having said that, I totally support you in getting him to take medicine, silly GP. Maybe the bee venom has long-term benefits. I'm sure I read a horror story somewhere in which a man who was stung by a bee ended up turning into a giant bee. Or something like that. wv - vivexism - deary me, that sounds a bit naughty. Paul, that's what I hear, but if GP hasn't done me in by now, I expect he won't. Cathy, would the giant bee be a stinging bee? Ooh, that would not be good. "Good he didn't swallow it, isn't it?" I don't know why he'd do that. I suppose it would not be good, Mimi, but you would have an inexhaustible supply of honey. Porlock, GP could have swallowed the bee in a gulp by accident.